Here he is guys! 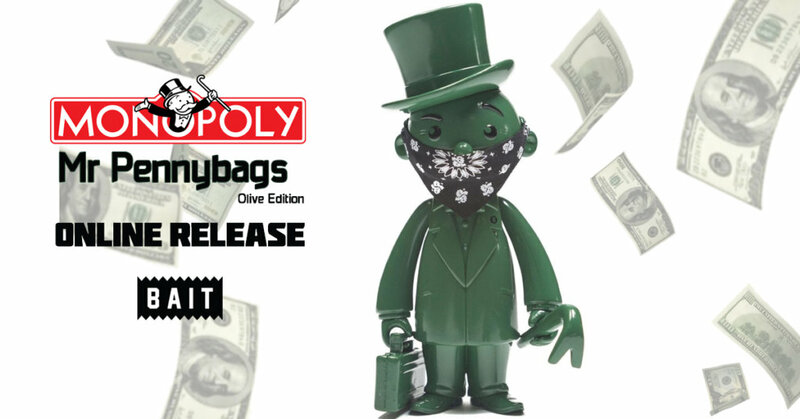 You’ve waited patiently for the online release of BAIT x MONOPOLY official 7″ MR PENNYBAGS Vinyl Figure, after making its debut at ComplexCon over the weekend. Mr Penny Bags from the board game Monopoly gets turned into a fully fledged licensed Hasbro figure with the help from SWITCH Collectibles. After last year’s success, the classic Mr Pennybags goes Olive to match the bank notes. Mr Penny Bags waiting to take your money as BAIT have made them available online NOW. BAIT has teamed up with Hasbro to commemorate the original get rich or die trying board game.